I Think I'll Try Landscaping! We have lived in this house a year! June 6 was our 1 year mark! Crazy. 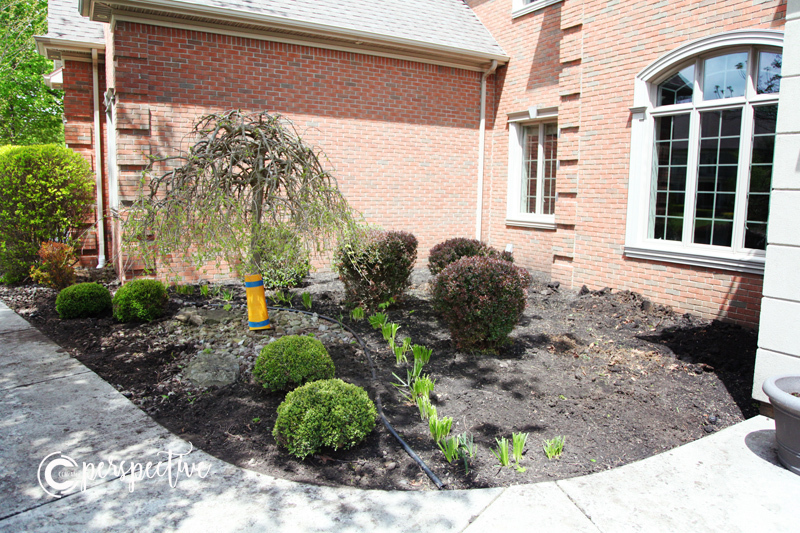 This spring we decided to take on the front yard. As you will see it really left something to be desired. Easily maintainable, sure, but nothing special, or appealing to look at! I have confidence in my ability to design and decorate inside. Outside, is a different story. But, how hard can it be?! I think I'll try something new! Add DIY landscaping to my list! 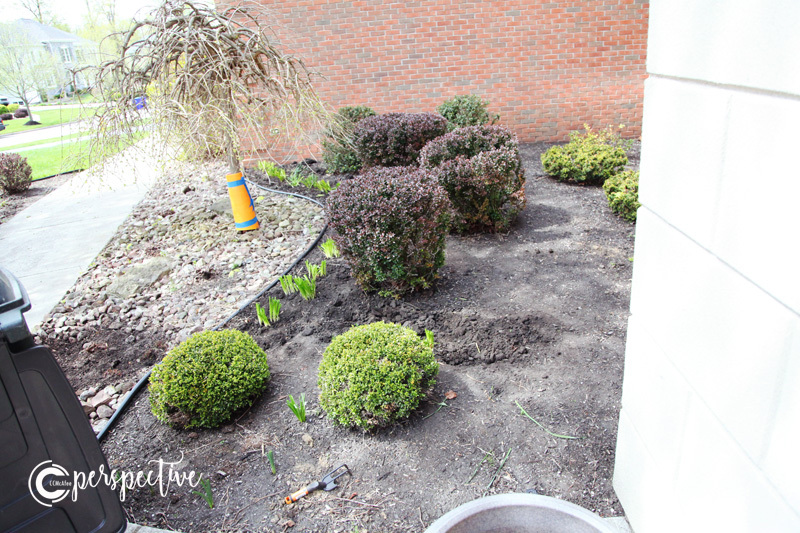 I was totally bothered by the globs of bulbs randomly popping up, the deer chomped shrubs, the tiny bushes behind the big bushes, rocks everywhere, no flowers, that probably about covers it. When my mom was here we talked a little bit about how to design these three beds in my front yard. It took me a while to think through what I wanted. I haven't really designed outside so much. I did know that I wanted flowers and order! 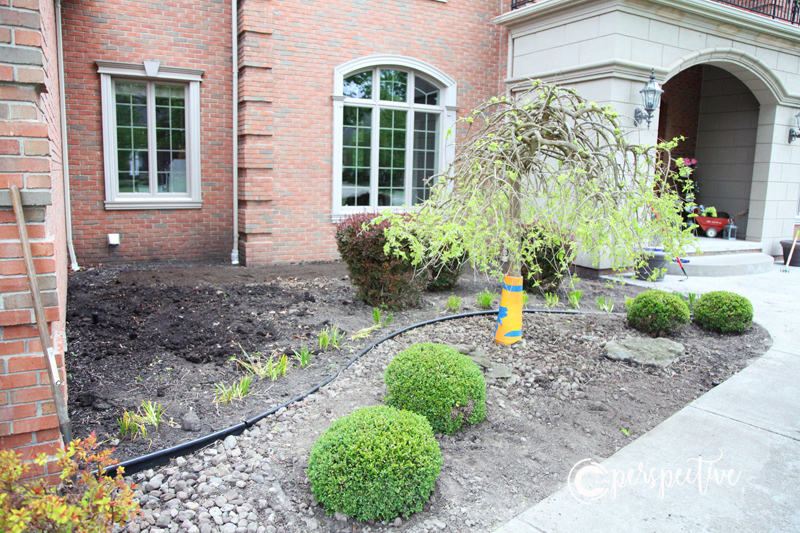 We talked through some ideas, and she and I started transplanting grasses that were in the front bed. I'm not showing that bed today, because that is bed #3! (Matt and I had to label each bed, so he knew what I was talking about where.) Just starting somewhere was a good way to get my visionary brain going. Today I'm showing the transformation of bed #1. This one isn't quite done yet. We still need to put down some slate for a little sitting area. It is mostly done, though, and I love how it turned out. Here is the before and after. So take a look back at that 'before' photo. Pretty much the only thing that stayed in this bed were the daffodils (and one purple hedge, which I don't know the name of, they are prickly), of which I broke up to line the front of that back portion with. Really with the blob of daffodils right? Who does that? And, look at all of those rocks! 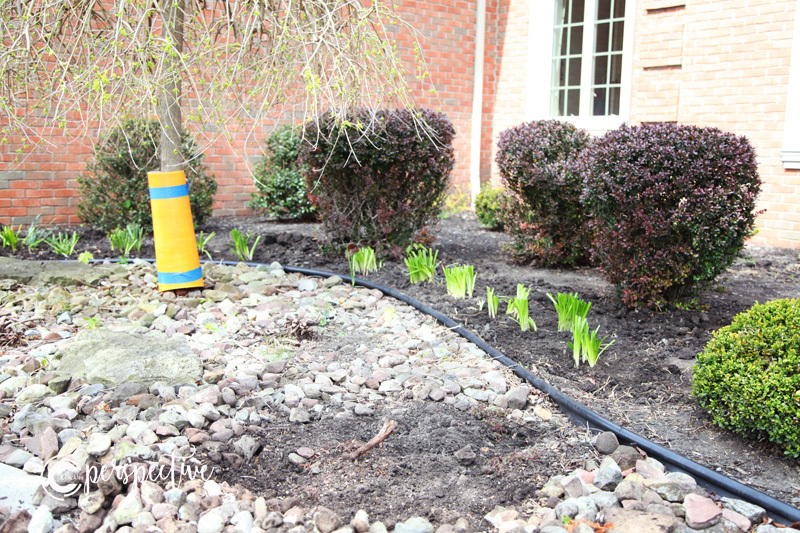 After moving daffodils I split and moved the two mum plants that were in here. They are in beds 2 and 3. Next I thought about the boxwood's. There were two on each side of the house. I decided I wanted them to live under our little tree. That was a decision with a lot of commitment behind it. 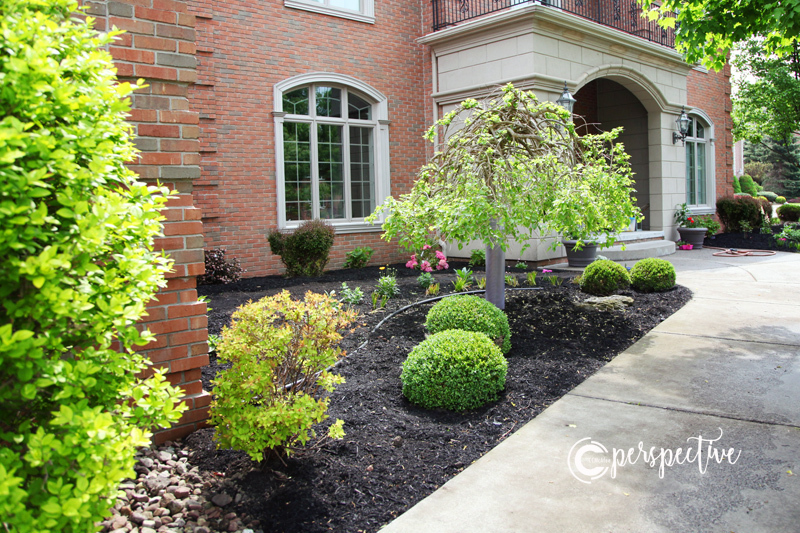 In order to get those 4 boxwood's up front, I'd have to remove rocks, lots of rocks. My back was so tight from hauling rocks to the other rock beds we have. So glad it's over! Of course I just started with one and that didn't seem so bad, I'd just clear out the spots where I was going to plant... for now, until I could get my strapping man to help me. Matt was fabulous getting these plants brought to the front. We worked to get rocks out, made the kids help too, of course! This is a great spot for them. 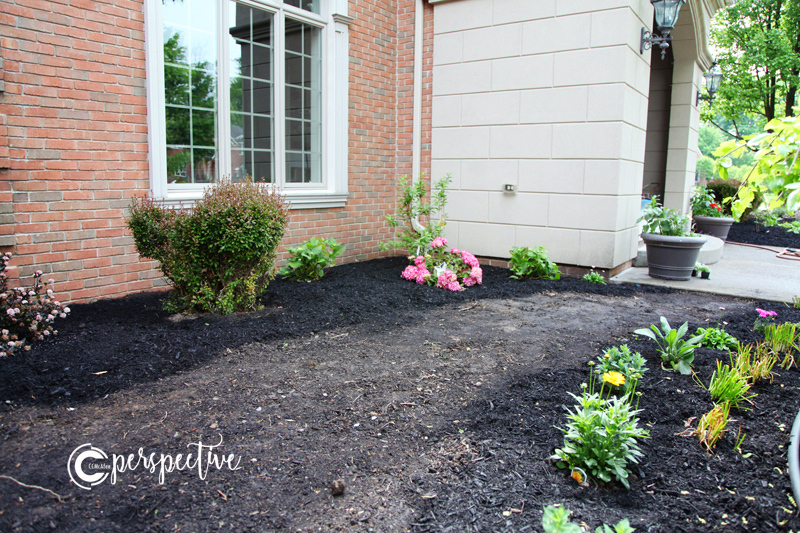 It was at this point we decided to bring in more dirt as well as mulch. Beds 1 and 2 needed to be built up in some spots, this front being one of those spots. I took out most of the rocks, but didn't get all of them out, especially in the parts where I don't plan to plant anything else, like around the tree. I left some rocks there, they will help with weed control. We just added some dirt on top of it. Let me tell you the story of this orange thing around our tree. Last summer Q let out a yelp from her room one afternoon. She saw something in this tree, it was one of our local groundhogs, just chillin in the tree eating lunch! Apparently this was why the tree was bald all along the top of the tree! That blasted thing would just climb up whenever he wanted, eat to his hearts content, and leave my tree bald! Matt grabbed this orange sled from our garage and taped it around the trunk! It seemed to work, much too late in the year to make my tree look nice, but it kept that little poop from eating any more of my tree. And look at it! It's orange! Matt's solution to help it look a bit more 'natural' was taking a clear office floor mat and wrapping that around. I pruned it up a little this spring and that tree has come back. It looks great! Next on the list, removing the Yew that the deer love to eat. After that we took out the Holly bushes as well. Then, we brought in some dirt. I have to tell you that I totally appreciate my man jumping right on board with this. As I would work all day outside he could start to see, and trust me! He was all in, helping when he could (his brute strength were much needed) and letting me direct and bring to pass my vision. The next part was fun, and new for me. After we got our dirt and mulch it was time to get busy planting. I had a few ideas of what I wanted, but wasn't 100%. We went to the nursery one Saturday and he let me go on a shopping spree of sorts! It was so fun for me to pick what I wanted! It was awesome! We came home and I put things in place and we started planting! We planted so much! Again, this is just one of the beds. By the end I was ready to bury my shovel! 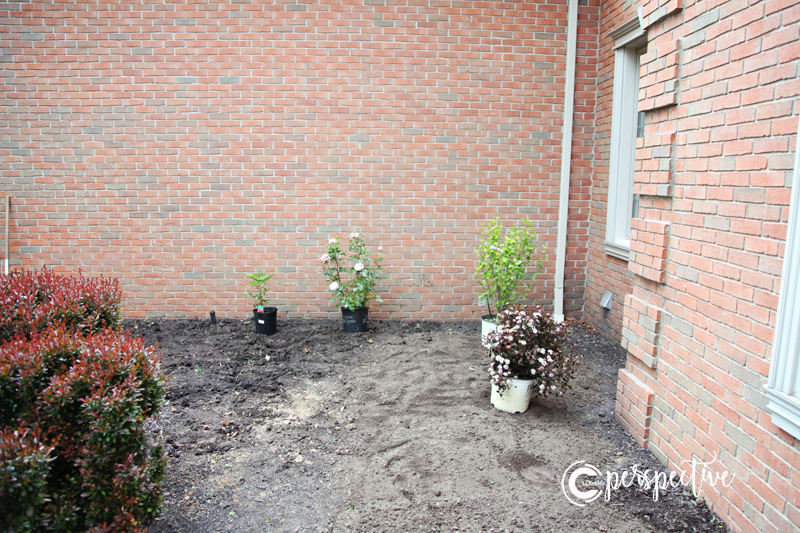 These three purple bushes were transplanted. I moved 2 to bed 2 and moved one closer to the house in this bed. I put Rose of Sharon, roses, peony, forsythia, hydrangea near the back of the bed, and a whole bunch of other flowers in the front. Here is where I now have order! The taller things are in the back, by the house. The ones that get large are in front of the brick wall, potentially covering that blank wall. The smaller things are near the tree, so you can see over them to what is behind. While I began planting, Matt mulched under the tree. That gave us a much needed push, it looks so purty! After all the planting was done I spent my days mulching. I'd come home from my run and mulch, mulch, mulch. Here is how it looks, mostly finished. We now need to put in a little sitting area. I love how it turned out! The flowers are now blooming, there is color, it is soft and orderly. I love it! And, like a lot of things it will just get better with time, as things grow and get more substantial. So much work, but so great to try my hand at landscaping, and succeed! I am my mother's daughter! The flowers are now blooming, there is color, it is soft and orderly. I love it! And, like a lot of things it will just get better with time, as things grow and get more substantial. So much work, but so great to try my hand at landscaping, and succeed! I am my mother's daughter!